HUGE Congratulations to Ruth and now "MACH" Caol ila who earned her Agility Championship this past weekend at the Staten Island Dog Training club! She shared this accomplishment among her friends and breeder. I have know Ruth since starting the sport if agility. Ruth and her husband Neil had some of the fastest agility Dogs back then and it was always exciting to watch them! When the sport was new they always went out and were terrific sportsman and enjoyed running their dogs! It was a great honor when Ruth decided to train "Caol ila" with me as a puppy, trusting me with her foundation training! This is a very special accomplishment to me as a trainer for such a fantastic team! I'm very proud to know them both and be able to be part of their success!! Christina and Allie earned their USDAA Performance Dog Champion Title in March of 2017! The team's first Championship! Thank you Kim for all of your help, encouragement and advice! We couldn't have done it without you. Crockett began in Kim’s puppy foundations classes the week I brought him home, at 8 weeks of age. The program was great for building body and foot awareness, which Crockett was going to need as he grew and matured. The program also instilled confidence and developed our wonderful working/playing/team relationship. This is a relationship that benefits us in everything we do, from agility, obedience, draft work, to everyday activities. With the help of Kim’s insightfulness Crockett achieved his MACH just shy of his 5th birthday making him the very first CH MACH Bernese Mountain Dog in history! Crockett, also, is the 2016 AKC Invitational #1 Berner. Thanks Kim! Chris and Emma earned their USDAA PDCH Title! As the saying goes, "It takes a village," and many people played crucial roles in Tembi's finishing her MACH at the Golden National Specialty. First, huge congratulations to Christina Turner who willingly accepted the challenge last winter when my old-lady knees and family life made getting those last 13 QQs a daunting task. Christina embraced Tembi's quirky personality and quickly forged a relationship built on trust and mutual admiration. Once they gelled as a team, these ladies went on a roll, including 4 weekends with back-to-back QQs. Along the way, they finished Tembi’s MXB, MXF, and T2B2! 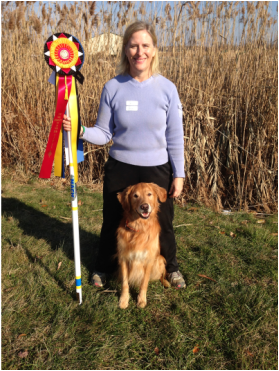 Thanks to Kim Seiter for guiding Tembi’s agility career for the past 7 ½ years. Tembi marches to her own drummer and Kim has always offered concrete suggestions that enabled Christina and me to “embrace the freak.” So proud of my Temboni who, today, became one of a small number of CH MACH Golden Retrievers! Woohoo! Kodak has turned into such a great agility partner! With Kim's advice, Christina has brought Kodak to his true potential and watches his confidence grow each time they step to the line. 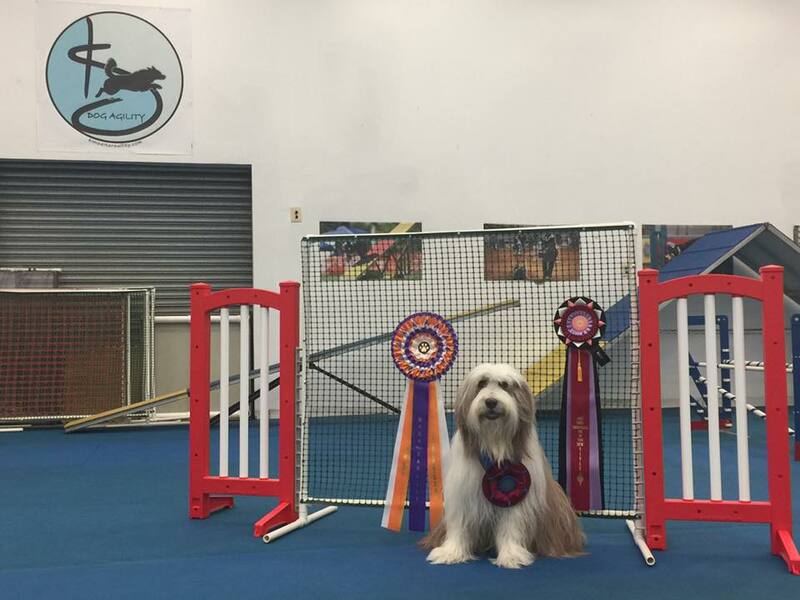 Kodak has learned how fun agility can be and is currently working towards his Excellent Standard title in AKC, his Masters Jumpers title in AKC, and will be working on USDAA Advanced titles this year. Kim encourages this team to do much more and they can't wait to see where they can go! Patty Hobin and Cutwater Capture My Heart OA JX "Nettie"
I was lucky enough to get Nettie at 14 months old and have been with Kim since then. We were able to finish NA and NJ at the 2014 Portuguese Water Dog Trials in Gettysburg PA taking 1st place in both classes. As of mid November 2015 we have 2 legs towards excellent standard and one towards masters jumpers. Roo is now 1 year old and we are in the Fundamental Handling class. Having trained 4 beardies for agility previously, I am enjoying a new technique by working on handling skills separately from obstacle performance. Roo is a live wire and Team Roo will need all the help we can get from Kim but I am sure we are in the right place. My biggest accomplishment with Caol Ila is not the number of titles but being part of a great team with my dog. Caol Ila is my 4th agility beardie but the 1st that I ever trained with Kim. I was looking for a new way to train and found that with clicker training and shaping. I have had so much fun with this dog from the age of 12 weeks, just learning to learn. Caol Ila is the most honest dog. She tries her heart out and any errors we make on course are due to my handling error. Now I have a beardie puppy – Cao Runn and will follow the same plan! Of to a great start in Jet’s agility career, competing at Masters and Excellent levels in AKC at two years of age. We’ll be taking a break from AKC, to work on building confidence and speed utilizing the UKI and USDAA venues, with Kim’s tutelage. A truly multitalented Golden, Jet achieved her GRCA Versatility Title with her AKC AXJ and JH titles and GRCA CCA title. Christina can not thank Kim enough for everything she has done to make this team what they are today. She taught Christina to embrace Allie for who she was and showed her what they were missing most when they started with Kim - a strong relationship. Christina has been able to improve Allie's confidence and she has turned into an amazing agility dog. Allie is currently working on her AKC PACH. Allie attended her first ever World Cynosport Games in 2015 where she was a Performance Speed Jumping Semi-Finalist! The team had such a blast and can't wait to see what the future holds! The team also attended the 2016 AKC National Agility Championships where they had two clean rounds and went into the hybrid round sitting in 7th place! Kim made all the difference in Teddy's agility career, teaching Christina what Teddy needed with her as a handler and encouraging the team to do so much more than they ever imagined! Christina is proud to have earned both Masters Titles in AKC, and will continue to pursue earning Teddy's USDAA PDCH. Teddy also attended his first ever Cynosport World Games in 2015 where he had the time of his life! I can't recommend Kim Seiter enough for the achievements Pazzo and I have attained. Our MACH and for Golden Retrievers the AGILITY DOG HALL OF FAME! I always wanted a big gorgeous golden but never dreamed that he could be such an excellent competitive athlete! With Kim's eye and ability at training we able able to bring out the best in Pazzo. We started with Kim when Pazzo was eight weeks old. We developed his strength, attitude and confidence. Kim then introduced him to the obstacles and handling for agility always keeping it fun but precise. She continued to check his weight and muscle mass over the years making sure he was in top form. She never gave up on me and always knew Pazzo could do it! Sue & Inas and her other Hungarian Mudi for over 10 years. She has trained Inas since he was a puppy. He always brings his best paw forward when running agility, he truly seems to enjoy the sport! Inas has qualified for the 2013 AKC Agility Invitational in Florida. Last year he also qualified so Sue & Inas made the trek down to Florida to enjoy the festivities! This was a first time attending such a prestigious event for this new team, who came in 2nd out of 5 other Mudis competing, and 52nd out of 140 dogs in his height class! Team Mudi has also qualified for AKC National in 2014. Under Kim's excellent training and influence, Sue and Inas are enjoying the journey playing this agility game, and continue to grow their relationship to be the best team they can be! Inga Hooper and MACH PDCH Baron! Inga and Baron, her 7-year-old Golden Retriever and first Agility dog, finished out 2013 earning two Championships just three weeks apart. On November 9th, Kim Seiter and her amazing partner, Phoenix, ran with Inga and Baron to earn the final Pairs leg they needed to finish the USDAA Performance Dog Championship (PDCH) title. Then, on December 1st--their last competition day of 2013--Inga and Baron earned their 20th QQ for the AKC Master Agility Champion (MACH) title. Inga and Baron have trained with Kim since Baron was six months old. Kim has guided this team always emphasizing patience, consistency, and most-importantly developing and maintaining a relationship based on trust and respect. Fran and Colby finished their PACH on 12/22/13! Colby earned his 1st QQ on June 1, 2013 and he finished his PACH in less than 6 months! He is still ranked the #2 Preferred Labrador in AKC rankings.